A uniform is not required for participation in any 4-H sponsored activity, event, meeting or occasion. The CDFA Fairs and Exposition Rule Book and the 4-H Youth Development Program do not mandate a uniform or attire for judging. Fairs do not fall under the jurisdiction of the 4-H program and may require their own clothing for showing. Please check with your local fair for specific details. 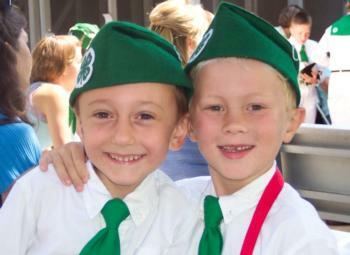 The California 4-H Youth Development Program adopted new 4-H uniform guidelines as of July 1, 2015. The decision-making process included a 4-H member design contest and voting by 4-H members and adults. See the California 4-H Uniform Guidelines and California 4-H Uniform FAQ for complete garment details and the transition plan to the new uniform guidelines. Official green uniform 4-H hat branded with the University of California, Agriculture and Natural Resources (UC ANR) and the 4-H clover logo mark. We are the only state to have a 4-H uniform hat. Many members display their achievement pins on their hats. A 4-H hat is NOT required for membership in the California 4-H Youth Development Program or for participation in any 4-H activity, event, or occasion. A plain white shirt with a collar. Any length of sleeve, including sleeveless is acceptable. OPTIONAL: A traditional 4-H tie or scarf worn with the collared white shirt. The tie and scarf are both worn under the collar. Any member can wear either the scarf or the tie--whatever the member is most comfortable wearing. Alternate Casual Uniform: For casual events, members may wear their club or county 4-H branded shirt without the uniform hat. Club and county 4-H shirts must properly display the 4-H emblem according to the California 4-H Branding Toolkit. This company is listed as a resource only and does not imply endorsement by the 4-H Youth Development Program.